Pay little attention to his worst moments. 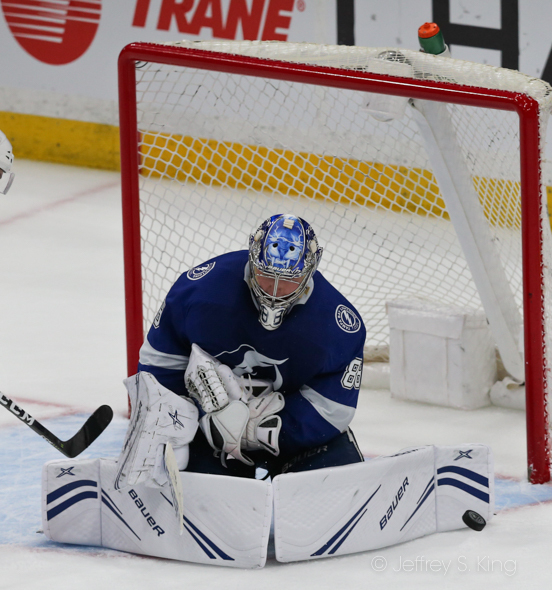 Andrei Vasilevskiy allowed in four goals Wednesday night. He allowed the goal to tie the game and force overtime with 53 seconds to play. On the other hand, he was terrific. Vasilevskiy faced a franchise-most 58 shots Wednesday night, stopping 54 of them to lead the Bolts to a 5-4 overtime win over Washington. It beat the franchise save record of Ben Bishop by six shots (Bishop set the previous record of 48 in 2014). Vasilevskiy has now won 15 of his last 16 games and is 36-8-4 on the season. It continued the Bolts exceptional season with the team's 57th victory over the year. Their 118 points trails only five previous President's Trophy winners. Their 57 wins are tied for sixth most of all time. “Vasy was sensational," said Steven Stamkos. "We didn’t play our best. I thought we got some big power-play goals at the start of the second. We just weren’t smart with the puck, a couple turnovers that fueled their rush, and if you give a good team like that chances, they’re going to bury them. They got some life and they just carried it. Victor Hedman scored the winning goal 3:01 into overtime. Nikita Kucherov had two goals, Steven Stamkos one and Anthony Cirelli one. Special teams also played well for the Bolts. Tampa Bay allowed only one goal on six pentaly kill opportunities and scored a goal on all three of its power play chances. Kucherov and Stamkos each have 37 goals on the season. 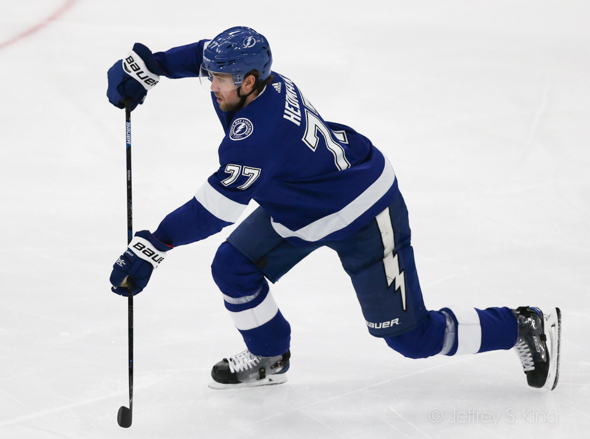 Brayden Point has 38, which gives the Bolts three of the top eight scorers in the NHL. The Lightning plays again tonight against Carolina at Raleigh's PNC Arena. The puck is schedule to drop at 7 p.m.
Great to see the Lighting continuing to play hard and win games through the end of the regular season but it does seem to be time to give Vasy and maybe some others a little rest to keep them healthy and fresh for the playoffs. I’m sure the backup goalie will play tonight but I’d like to see more nights off for Vasy from this point on before the playoffs start. I understand. Cooper isn’t big on letting off the gas pedal, is he? Ive said this before: One of coaches’ hardest decisions is the age old equation of when to ease off and when to allow his players to stay sharp. Remember Dungy letting most of the Colts off, and then losing to a Pittsburgh team in the playffs? I’d certainly slack off some with Vasi, and maybe reduce the minutes for Hedman, Kucherov and Stamkos. But I really think he’s paranoid about a rusty team.